Measuring wind speed/air velocity in a tunnel-ventilated house can be a challenge. Even in the best designed house wind speeds will vary hundreds of feet per minute depending on when and where it is measured. Wind speeds tend to be highest toward the center of the cross-section and lowest near the floor next to the side walls. How much the wind speed varies depends on house construction, the number of fans operating, proximity to the tunnel fans or tunnel inlet, equipment installation, and whether there are birds present. One air velocity measurement that doesn’t significantly change within a house is the average velocity (within any cross-section of the house). The fact is that if the ceiling height or house width doesn’t change and the side wall inlets are closed, the average air velocity must remain same from the tunnel inlet to the tunnel fans. What can and does change is any individual air velocity measurement within an air velocity profile. For example, the air velocity you measure in the center of the house five feet above the floor can vary significantly as you move from the tunnel inlet to the tunnel fans but if you were to take multiple measurements across each profile, there would be no change. Figure 2 is a graph of 15 different air velocity measurements, taken every minute, across the profile of a 40' X 500' tunnel-ventilated house 104' feet from the tunnel fan end wall for a 30-minute period. Measurements were taken two feet off the floor, two feet from the ceiling and four to five feet above floor at five locations across the width of the house (4', 12', 20', 28', 36'). With all the fans operating the average air speed was 721 ft/min. The lowest measured air velocity was 645 ft/min (two feet above the floor near the right side wall), the highest 817 ft/min (center of the cross-section). Air velocity profile measurements were repeated at 116',164', 212', 260', 308', 356', and 452' from the tunnel inlet end wall. Though the air velocity measurements varied as much as 150 ft/min at any given location within a profile, the average air speed across all the profiles typically varied less than 20 ft/min. There was no overall increase or decrease in average air velocity from the tunnel inlet end to the tunnel fan end of the house. Air velocity was a little higher just before and after the rolled up half house curtain because it temporarily, slightly decreased the cross-sectional area of the house which resulted in a slight increase in average air velocity. The air velocity just past the tunnel doors was approximately 30 ft/min greater than the average and was likely the result of a slight measurement error due to the air turbulence common in this area of a tunnel-ventilated house. The fact that the variation in average air velocity (15, one-minute readings) within any profile was typically less than 150 ft/min is likely due to the fact the house had smooth side walls and tunnel doors. One notable area of “slower” air velocities was near the side wall on the “left” side of the house on the tunnel fan end of the house. The slight decrease near the side walls was due to the presence of three forced air furnaces positioned near the side wall on the nonbrooding end of the house. The forced air furnaces slightly diverted air off the side wall which resulted in a slight increase in air velocity closer to the centerline of the house. The average air speed across the profile remained the same. Producers often comment that the air velocity in their houses decreases as the air moves towards the fans and house leakage is often cited as the cause. The fact is that it is basically impossible for the average air speed to decrease as the air moves from the tunnel inlet to the tunnel fan end of a house because this would only happen if the amount of air flowing down a house decreased from the tunnel inlet end to the fans end of house. Leakage would in fact cause the amount of air flowing in the “pipe” to increase along the length of the house: more air, same cross-section, higher air velocity. But, in a typical house the increase in average air speed due to leakage would be less than 20 ft/min. In a very loose house, the increase in air speed could be 50 ft/min. In either case the increase in average air speed would be difficult to measure. It is important to note that there are two areas of a tunnel-ventilated house that will unavoidably have lower average air velocity, namely the tunnel inlet and tunnel fan areas of a house. In these two areas you have air entering and exiting the house which results in a reduction in average air velocity. Near the end walls there is actually very little air flowing in the house which results in very low average air velocities. As you move from the tunnel inlet end wall to the fan end of the tunnel inlet the amount of air flowing in the house is increasing and as a result air velocity increases. Maximum air velocity is not achieved until you reach the end of the tunnel inlet opening. At the fan end of the house the opposite is occurring. As air exits the house via the exhaust fans the amount of air flowing down the house decreases and as a result so does the average air velocity. To minimize the number of birds potentially adversely affected by low air velocities, these areas should be kept as short as possible. In the tunnel inlet area pad height should be as tall as possible should be used. In the tunnel fan end large tunnel fans should be used and placed as close together as possible. Accurately measuring the true average air velocity in house can be a difficult task. Air velocity measurements need to be taken at multiple heights and locations across the width of a cross-section of the house. The greater the number of measurements the higher level of accuracy. In Figure 3, over 225 individual, one-minute measurements were taken for each air velocity profile to obtain a highly accurate average air velocity measurement. This level of accuracy is of course not practical or necessary in most situations. 1) Measurements should be taken within 50 to 100' of the tunnel fans. The air movement in this area of a house tends to be less turbulent and more uniform, making it easier to obtain more consistent readings. 2) Measurements should not be taken within 50' of a partial house curtain. The temporary reduction in cross-sectional area results in a temporary increase in air velocity. 3) Measurements should not be taken in the center of a cross-section. The air velocity in center of a “pipe” tends to be the greatest and as a result tend to be the least representative of the air velocity that most birds experience. 4) Instantaneous measurements should be avoided. Air velocity tends to vary significantly moment to moment and as a result it is always best to use a meter that provides an average reading over 15 seconds or longer. 5) Measurements should not be taken near bird level. Air velocity measurements taken within a couple of feet of the floor can vary 100 ft/min or more depending on the level of bird activity, making it very difficult to obtain a consistent and accurate readings. 6) Measurements should not be taken directly over a feed or water line. Dust covered cables can slightly reduced air velocity in these locations. Field trials conducted on the above farm, as well as, over a dozen others have indicated that the best locations to obtain a relative accurate measure of average air velocity tends to be four to eight feet from the side walls, at a height of approximately four to feet above the floor, 50 to 100' from the tunnel fans. Ideally two or three measurements would be taken at each location and then averaged. 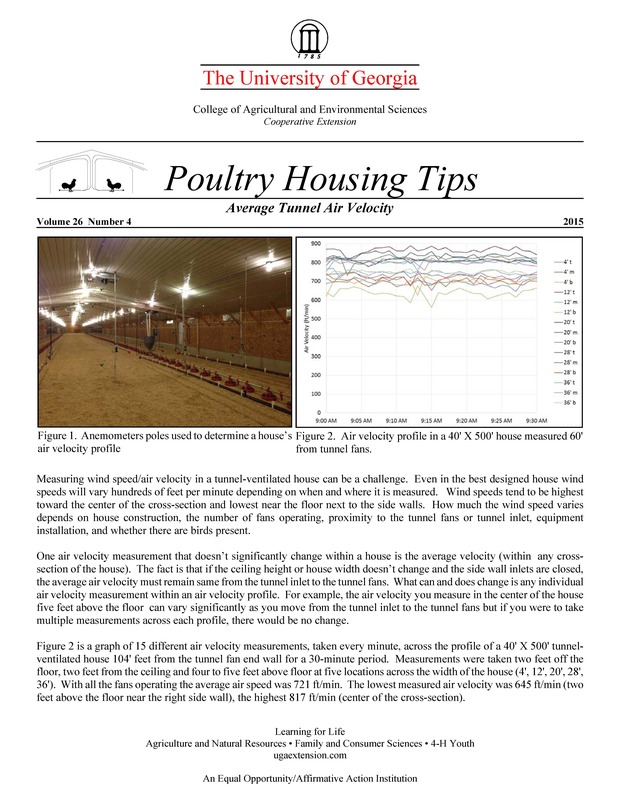 Though this tends to produce lower average readings than methods typically employed by many farmers and poultry companies, it does tend to provide with a minimal amount of effort the overall best indication of the average air velocity in a typical tunnel-ventilated broiler house.